I was staring at my desktop for a while and I thought to myself..
"What a boring picture I had in my desktop!" So I decided to make my desktop looking pretty! I came across pixelgirlpresents and found some interesting icons and wallpapers. These are just some example from the website. It's easy to download. Find the ones that you like and click on the icon of the Operating system that you are using. 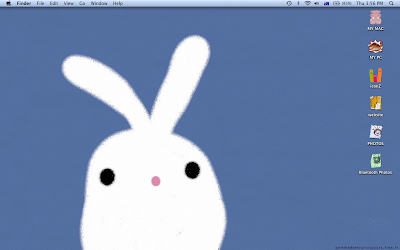 Look at my cute white bunny wallpaper and those cute icons I'm using! I like your blog.I'm waiting your new posts.